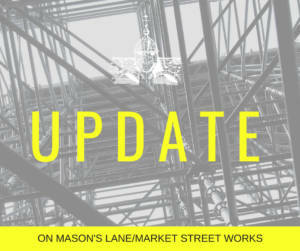 On Wednesday 8th August, incoming drivers experienced severe delays throughout the Town, extending to many further incoming roads, when scaffolding was erected on Mason’s Lane for works on a property flanking the road. No traffic control system had been implemented which resulted in chaos as vehicles became backlogged in both directions. As a result, many drivers became frustrated with some unfortunately becoming abusive to the Contractors on site. Town Council officers were alerted to the problem and contacted Wiltshire Council immediately to request assistance. Officers contacted Wiltshire Council again during the afternoon to be told that upon further inspection, Wiltshire Council had now requested that the contractor implement a traffic light system by 5pm that day. We are aware and understand that many residents/commuters were frustrated due to both the lack of a traffic control system and also not being forewarned of any works which impacted the smooth flow of traffic. We had requested permission from Wiltshire Council and obtained all required licenses prior to commencing work on Masons Lane today. The works to be carried out are for a charitable organisation who have been waiting three years for the permission to be granted. It was organised so that it would be carried out during the school holidays to cause the least amount of traffic disruption. When we initially approached Wiltshire Council we suggested that we should have traffic lights installed however we were advised that this would not be necessary and we were provided with traffic management plans to include fencing off a walkway, coning off the area and providing traffic signage. Prior to starting work today we ensured that all requested traffic management measures were in place. Unfortunately the traffic situation became extremely difficult very quickly and my team and I suffered much abuse and threats from motorists caught in the traffic. Mid-morning a highway officer from Wiltshire Council attended and advised us that we would require traffic lights to be installed by 5pm today. This was organised by myself and these were operational by 4:55pm today. As a Scaffolding company that’s prides itself on its reputation and efficiency we feel extremely saddened by the negative comments received. It is insinuated that it was our lack of planning and permissions that caused this situation today however we did everything Wiltshire Council requested and required of us. Following on from discussion at next week’s meeting, we will be raising this matter with Wiltshire Council.